Sinn Féin Louth TD Gerry Adams has welcomed the decision by the High Court to instruct the Special Criminal Court to hand over transcripts of proceedings before the Special Criminal Court relating to Adrian Crevan Mackin who shot dead Garda Tony Golden in October 2015. “Crevan Mackin shot dead Garda Tony Golden in October 2015. He also shot and grievously wounded Siobhan Philips, before killing himself. Crevan Mackin was previously arrested in January 2015 in possession of explosives and firearms, which he admitted. He was not charged with these offences but instead with an offence he had denied. He was granted bail in the Special Criminal Court. I have raised my concerns about the manner in which Adrian Crevan Mackin was dealt with by the Garda, the many offences which he admitted to but he was not charged with, the low bail that was set, and his access to other weapons, with the Minister for Justice and An Taoiseach. In April the Garda Síochána Ombudsman Commission (GSOC) agreed to initiate a public interest investigation into these matters after I wrote to it and presented it with papers that I had received relating to the case. At the time I gave these papers to the investigating officer in the Garda, to GSOC, to the former and current Taoiseach and to the former and current Minister of Justice. The decision by the Special Criminal Court to refuse to hand over to GSOC the transcripts of proceedings involving Crevan Mackin was incomprehensible. That one part of the justice system would refuse to cooperate with another is a matter of grave concern. Public accountability and public confidence in the rule of law and the institutions of policing and justice are essential. GSOC should never have been forced to go to the High Court”. Sinn Féin Louth TD Gerry Adams has called for urgent action from the government to “end the environmental and health threat that faces thousands of citizens in Louth at risk from the discharge of raw sewage and the non-compliance of EU regulations in the treatment of urban waste water”. “The recently published Urban Waste Water Treatment in 2017 report by the Environmental Protection Agency makes depressing reading. The government and Irish Water are failing to meet their commitments on investment in water treatment. 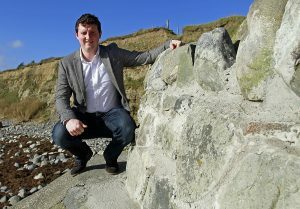 13 years after the final deadline to meet treatment standards there are still 28 towns and cities in this state, one of which is Omeath, discharging inadequately treated sewage. The EPA warned that this is “putting our health at risk and is having an impact on our rivers, lakes and coastal waters.” This amounts to raw sewage from the equivalent of 88,000 people in 38 towns and villages flowing into the environment. According to the EPA report there are 132 urban areas where improvements are needed to resolve environmental priorities. Seven of these are in Louth at Ardee, Blackrock, Castlebellingham, Dundalk, Dunleer, Omeath and Tallanstown. In addition, there are 28 large urban areas that have failed to meet the EU’s legally binding standards for the treatment of urban waste water. Ardee and Blackrock failed the secondary treatment requirements, while Dundalk failed the more stringent treatment requirements. The EPA also identified 57 areas across the state where waste water discharges are the sole significant pressure on water bodies at risk of pollution and not meeting their environmental objectives. Five such areas are impacted in Louth. These are Inner Dundalk Bay, Gldye, Castletown Estuary, White at Dunleer and the Glyde at Tallanstown. The fact is that the government’s short and long term strategies for providing a safe environment and clean water is failing to deliver for many citizens. More resources are urgently needed to target those areas which are currently not meeting basic environmental standards. Gerry Adams TD called on the Minister for Social Protection Regina Doherty to “take urgent action to ensure that workers from the Authentic Food Company have access to social welfare”. On Wednesday Gerry Adams TD met with the Liquidator, spoke to Enterprise Ireland and met with representatives of the UNITE union. “I first wrote to the company on 21 September having been contacted by workers and their representatives about rumours that Authentic Food was closing. The company did not respond to my initial correspondence or to representations from Sinn Féin Councillors Ruairí Ó Murchú and Anne Campbell. The Managing Director of Authentic Foods, Nik Basran, claims that the management carried out a comprehensive review of the business to try and find a way to make it profitable over the long term but he said this was not possible. The Minister has a responsibility to ask what type of review is it that excludes the workers’ representatives, that refuses to engage directly with UNITE. What kind of review is it that can be manipulated by employers so that these workers have no notice pay, no P45, no reference, and no redundancy payment. This is very calculated. It is sharp practice. Will the Minister give the Dáil a commitment that she will investigate whether this is a tactical insolvency? We need to establish if the British based Authentic Food Company deliberately wound down the Dundalk plant. The work force has been treated shamefully. They can’t access social welfare. I would urge the Minister for Social Protection to use her discretion to ensure that workers get their social welfare payments as soon as possible. I would ask the Minister for Enterprise to do everything possible to have this workforce reemployed as quickly as possible. The government needs to make it very clear that it does not countenance companies refusing to talk to trade unions in situations involving a restructuring or a closure. There is also an urgent need to prevent liquidations being used in a tactical manner to the advantage of the companies and the disadvantage of workers, their families and community. We have also had a bill passed at second stage that would address the issue of tactical insolvencies – the 2016 Protection of Employees (Collective Redundancies) Bill. Louth TD Gerry Adams this morning met with the Liquidators appointed on Friday in relation to the closure of the Authentic Food Company in Dundalk. Mr. Adams also spoke to Enterprise Ireland and held a meeting with UNITE this afternoon. The Louth TD, along with party colleague Imelda Munster, will be raising this issue later this afternoon in the Dáil with the Minister responsible under Topical Issues. Instead last Friday the company went to the High Court, a Liquidator was appointed and staff were told that the company was insolvent and unable to pay wages”. The Louth TD has accused the Company of treating the workforce shamefully. As a result, and on the cusp of Christmas they are “caught in a limbo. Technically they are still in the employment of the company though they will not be paid a wage. They can’t get their P45 to secure alternative employment, and they can’t access social welfare. “The Minister must do everything possible to have this workforce reemployed as quickly as possible. She also has to take steps to prevent liquidations being used in a tactical manner for the benefit of a company and to the disadvantage of workers, their families and community”. Sinn Féin Councillor Antóin Watters has called for a cross border approach to deal with the on-going problem of ‘boy racers’ in the North Louth / South Armagh area. Cllr Watters has requested a joint meeting with An Garda Siochaná and the PSNI, together with Cllr Liz Kimmons and it is hoped several issues relating to these boy racers will be addressed.